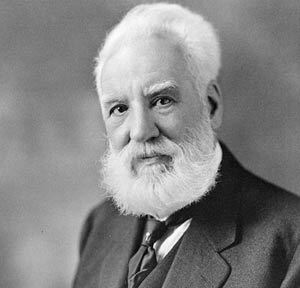 Alexander Graham Bell (1847-1922) Scottish inventor, most notably credited with inventing the modern telephone. In 1870, after suffering from tuberculosis (which killed his brother), he went to live in Canada with his brother’s widow. He enjoyed living and Canada, and he began to develop a method of teaching speech to the deaf. In 1873, he became a professor of vocal physiology at Boston University. In 1873, he also met and began courting Mabel Hubbard. They married in 1877 and had four children. In 1876 he submitted a patent for the acoustic telephone, something he had developed during long evening sessions with the mechanic Thomas Watson. This proved it was possible to communicate over long distances for the first time. His wife Mabel encouraged Bell (despite his great reluctance) to take and exhibit his telephone in a Boston exhibition. The new invention won a prize and much commercial publicity, which helped early sales. In 1879, the Bell Telephone company bought Edison’s patent for carbon microphone, and this enabled a big improvement to Bell’s initial telephone design. The Bell telecommunications company proved very successful. By 1886, over 150,000 people in the US, owned a telephone. It went on to become one of the most successful modern inventions. However, with many people working on similar patents for telephones at the same time. Bell’s patent for the telephone was frequently challenged in the court. Bell himself had to attend many court sessions, and this encouraged him to resign from the company. Ironically, Bell wasn’t over-keen on his invention. He later felt it detracted from his other scientific works, and he himself wouldn’t have a telephone in his office. 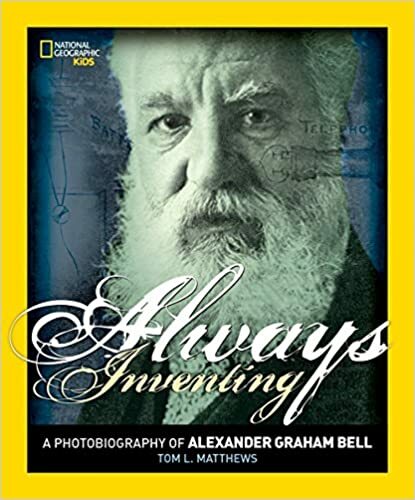 Bell was also the second president of the National Geographic Magazine from 1898, until 1903. He helped develop and shape the magazine into an influential and popular scientific magazine. Towards the end of his life, he continued to carry out varied scientific research in the field of aerodynamics, looking at giant kites and hydrofoils. He even speculated about the potential for using solar power to heat houses and ways to capture waste gases from farms and industry. Bell died of anaemia on 2nd August 1922, in his Scottish estate of Beinn Bhreagh, Nova Scotia. Citation: Pettinger, Tejvan “Alexander Bell Biography”, Oxford, UK. www.biographyonline.net – Published 10 March 2015. Updated 1 February 2018.